Habitat for Humanity is an international, nonprofit organization dedicated to building homes for families living in poverty. The vision of Habitat is to build a world where everyone has a decent place to live. To date, Habitat has helped build over 500,000 decent, affordable houses and served 2.5 million people worldwide. PC’s chapter of Habitat for Humanity sends over 100 students on Spring Break service trips each year, organizes Saturday Builds in the city of Providence during the academic year, and puts on campus events to educate the PC community about Habitat and raise funds for this great organization. Habitat for Humanity is an international, non-profit organization dedicated to building homes for families living in poverty. The vision of Habitat is to a build a world where everyone has a decent place to live. Through volunteer labor (from people like you) and donations of money and materials, Habitat builds and rehabilitates simple, decent houses alongside homeowner partner families. Habitat houses are sold to partner families at no profit. It generally costs $70,000-$105,000 to build a Habitat home, and a family's mortgage plan allows them to pay off this cost, without interest, over 2-30 years. Everyone who submits a completed application and the $50 deposit by the application deadline will be given primary consideration. Applications are due by 4:30pm on Friday, October 12th. $50 deposits are required and should be dropped off to Jane McGuirk in the Campus Ministry Center (basement of the Chapel) upon application completion. Both cash or check (made out to "Providence College") are accepted. Habitat for Humanity 2019 Spring Break Trips will take place from Saturday, March 9th to Saturday, March 16th. Each year, Providence College sends about 150 students up and down the East Coast to build affordable housing for families. For Spring Break 2019, we plan to send trips to a variety of places including Virginia, Maine, New Jersey, Pennsylvania, Connecticut, among others. Each year there are 12-14 different Habitat Spring Break trips. After applications are received, Habitat Spring Break Trip locations are selected by the Exec Board in October as part of the Habitat Collegiate Challenge. 8-12 students participate on each Habitat Spring Break trip, and is lead by 2 student leaders. Habitat Spring Break Trips are a great way to get to know fellow classmates outside the PC campus. Additionally, Habitat requires a family to contribute a certain number of "sweat equity" hours towards building their own homs and gain a strong sense of community. This helps homeowners learn to maintain their own homes and gain a strong sense of community and pride in their neighborhoods. Because the future homeowners are so involved in the construction process, you will get to meet the people who will own the houses you are building. Depending on your construction site, you may be building homes from the ground up, working on multiple homes in a Habitat neighborhood, or rehabilitating existing homes. Most Habitat affiliates house their volunteers in churches or local recreational facilities. You will have access to a kitchen, and some of your meals may be donated by local businesses, churches, or neighbors. You will have free time in the evenings to enjoy your group and the local community. Groups always come back with stories of country line dancing, waffle house excursions, bowling tournaments and great memories of staying in and playing games, watching movies, having dance parties, and generally enjoying each other's company! This year, the trip will cost $200 (your $50 deposit plus $150) per participant. This cost covers all fees assessed by Habitat for Humanity, insurance, lodging, transportation, and food. The Providence College Habitat Chapter will plan fundraising events during the 2018-2019 school year to help offset this cost for participants. We do not want cost to be a determining factor in your decision to participate in our trips, and if necessary, we can help you raise the money you need to participate on a Habitat for Humanity Spring Break Trip. If you have financial concerns, please contact Heidi Fraitzl, Campus Minister for Global Service (hfraitzl@providence.edu; 401-865-1944). Contact Heidi Fraitzl or Student Coordinator, Ryan O'Keefe (rokeefe@friars.providence.edu) with any additional questions. In line with the goals of Habitat for Humanity, the leadership team has developed a set of community standards to guide our time together. The following statements constitute that community agreement. Please check the lines to show that you have read, understand, and agree to uphold the following community standards. By participating as a student volunteer for Habitat for Humanity, I am acting as a representative of Providence College and Campus Ministry. As such, I will strive to maintain the highest standards of personal conduct, assuring that my behavior is morally and legally acceptable. I will adhere to all College policies set forth in the Student Handbook and respect all guidelines of our hosts and partner agencies. I understand that the Campus Ministry staff and Student Leaders are in charge of Habitat for Humanity Spring Break Trips, and I agree to respect their authority and decision-making responsibility. I understand that I commit myself to travel, live, and work as a member at all times during my Habitat for Humanity Spring Break Trip and that I will not go off by myself or leave the group without the knowledge of the Student Leaders. I understand that during my Habitat for Humanity Spring Break Trip, I cannot possess or consume alcohol, illegal substances, or drugs of any sort. How old will you be on 3/5/19? If you will be 18 or older, are you willing to be a driver? Why are you interested in participating on a Habitat for Humanity Spring Break Trip? Do you have previous service experience? If yes, please briefly explain. Are you interested in being a leader? What previous leadership experience do you have? 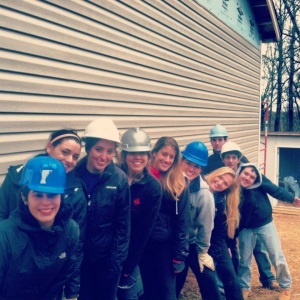 What motivates you to lead a Habitat for Humanity Spring Break trip? I understand that my application is incomplete until a $50 deposit is submitted. Deposits should be dropped of to Jane McGuirk in the Campus Ministry Center (basement of the Chapel) upon application completion. Both cash or check (made out to "Providence College") are accepted.